The rioting that spread through Britain’s streets recently has been shocking and saddening. Communities have been scarred and thousands of hard-working people had their livelihoods hit. Once again the talk is of how “broken” our society is. But there is also steely determination to repair. How? 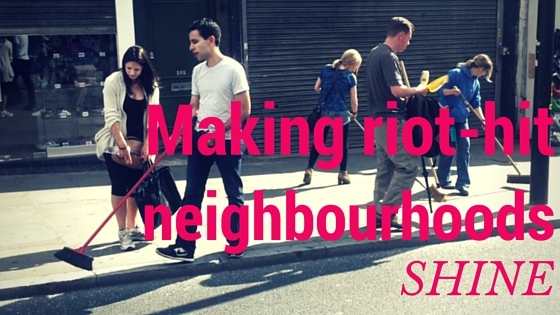 As with the urban riots of the 1980s, there is now a real opportunity for local communities, business leaders and others to work together to rebuild both the physical and social fabric of communities. We hope we can play a modest role in that process. Spacehive enables communities to build a shared vision for how to improve their area – and raise money to pay for it. They could be regenerated high streets that draw in shoppers and drive up footfall for traders, new parks that provide a bit of breathing space, or sports facilities that give kids something to do. Because our open platform allows anyone to support projects – either by donating or volunteering – it provides an opportunity for local businesses, residents, councils and corporates to work together to make things happen, quickly and easily. The hope is that it will give communities a powerful tool to turn their area around, giving everyone that contributes pride in the new places that result. No more depending on cash-strapped councils. After the 80’s riots businesses spontaneously came together to help create stronger, more vibrant communities. It showed just how much can be achieved when business gets stuck in. If the Big Society is to mean anything, we need this to happen again – and at scale. It ought to be an easy sell – we all win when communities are strong and confidant. The signs are looking good. Spacehive has just started scoping out regeneration projects in several riot-hit neighborhoods – from London to the North West – with local community groups and our supporters at Business in the Community, Your Square Mile, Design for London and the Royal Institute of British Architects. A couple of high street brands are interested in providing funding. So is a bank. So watch this space for news. In the meantime, if you’ve got a project idea that you think your community would love, please get in touch. We want to help.